The Honeywell 4600r provides high-performance presentation scanning of linear barcodes, making it ideal for fast-paced POS scanning applications. In addition, its ability to read all 2D barcodes, plus capture digital images, enables new applications that increase productivity - all with one device. The 4600r's unique Streaming Presentation Mode feature, combined with its omnidirectional reading capability, eliminates the need for operators to stop and hold an item in front of the scanner - simply swipe and go. In addition, the 4600r features an advanced illumination system optimized for high performance applications that require presentation or "fly-by" scanning and the reading of highly reflective items. 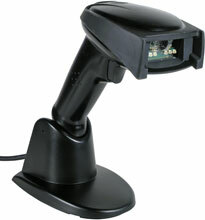 Retail Flex Neck Stand (with Out of Stand Sensor) Use with 4600R. Non-Cancelable/Non-Returnable.